Early on, Karen and I got this wild hair that we wanted a puppy. Every once in a while, a young pup would come through the adoption program for a variety of reasons. We just put it out there one day, we wanted a puppy. A few weeks later, we got a call, there was a five month old puppy in the adoption program. A five month old puppy! We had visions of this tiny, roly poly puppy. Ummm no. He was huge. He was goofy. We were in love at first sight. My youngest daughter Holly named him after the Paul Frank character, Skurvy. 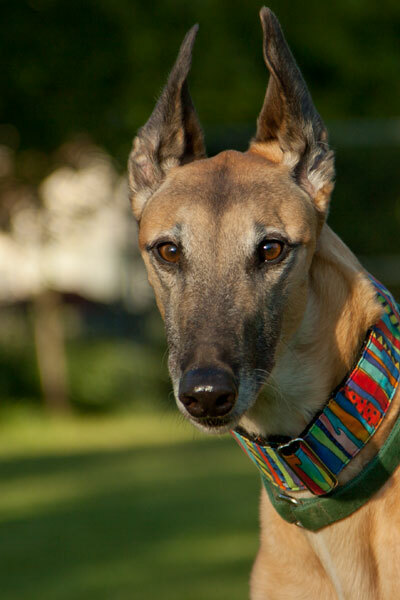 He came in and quickly learned from the older, more mature greyhounds. He loved to play, tug-o’-war with the wiemie was his speciality. He never made it to the race track because he had a crippled paw. It’s never kept him down though, he still races like the wind on the acre. Skirvee is probably our biggest boy. He is also our biggest wimp. We’ll never know how he weighs in comparison because he refuses to step on the scales at the vet clinic (sounds like me). It’s funny how life happens. At the time, we knew nothing about racing or greyhound farms. A few years after we brought Skirvee home, we met Nancy, she had the kennel where Skirvee was born. Years later when I went to visit her at the track in Florida, I met a pair of fawn girls, identical twins. I found out later that they were Skirvee’s litter mates. A few years after that, Skirvee was reunited with his twin sisters when they came home to Greyhound Gardens.